During the 2016/2017 criterium season in Melbourne Tommy Nankervis won 25 A grade races. It’s a feat that’s hard to fathom given the peripheral race day elements that can go against the grain of consistency. Crashes, breakaways, teams and general day-to-day physiological conditions are all uncontrollable components to a criterium, which make Tommy’s achievements quite astonishing. 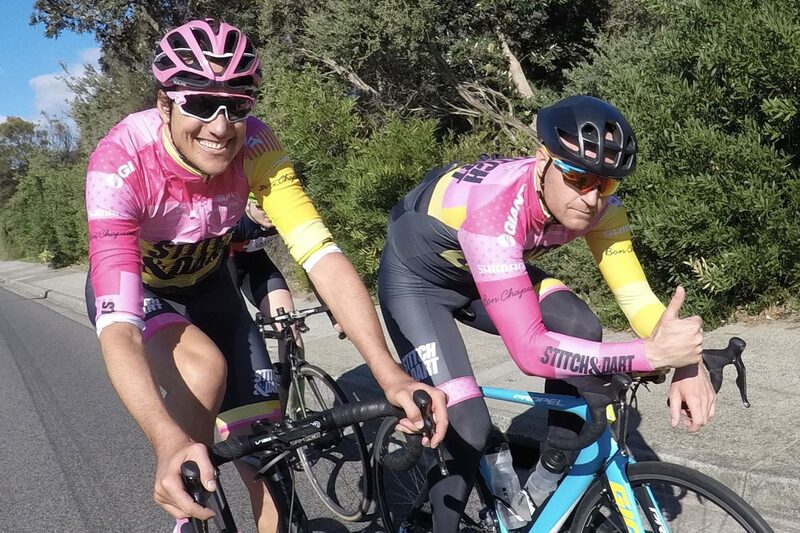 In this discussion we have two good mates – Lee “Hollywood” Turner and Tommy Nankervis – discussing the insights into what led Tommy to such a dominant criterium season. This podcast deep dives specifically into three key ingredients: training, tactics, and the mindset Tommy took into last season. Lee talks about the 25 win crit season i.e. how did it come about for Tommy and what did he do differently in the 2016/2017 season in comparison to other seasons. Tommy says the change in dynamic from a semi-professional team played a big role. His approach and emphasis on the crits was no longer about getting better for National Road Series wins. It was purely about racing the local crits scene. Tommy talks about being able to understand the race intimately and tactically, picking his battles wisely in each race. Robert Tighello has helped out over the past 3 years, since Tommy’s return to the Melbourne scene. A typical week of training for Tommy includes: Monday off; Tuesday morning easy; Tuesday evening race (Sandown with CCCC); Wednesday a 3-4 hour cruise; Thursday morning easy or track work in the evening with CCCC; Saturday morning Hell Ride (fast bunch ride) with some extras, and then racing on Sunday at Glenvale. Tommy makes the three race sessions count i.e. Tuesday at Sandown, Sunday at Glenvale and Saturday mornings fast bunch ride, which is similar to a race. On occasions Tommy has raced on a Thursday and interestingly he’s cooked for the week, having 4 main sessions in one week. Lee asks what drives Tommy to race so consistently, i.e showing up on race day week in week out. He hates to lose and he also likes to support his local club CCCC, helping him get out of bed every Sunday morning. Tommy’s lowest finish is 3rd at Glenvale since returning from the US. Tommy describes Glenvale as the toughest course in Melbourne, having a small uphill at the finish line, consistently windy conditions and a “false flat” on the back straight. Describing his positioning in a crit race Tommy sits back between 30-40th wheel because “everyone wants to be 10-20th wheel during the race”. Tommy gets into prime position only towards the end of the race. Lee raises the competition with Tommy. How does he react to certain riders? Tommy talks about teams being the biggest concern in comparison to strong individual riders because you have a team double teaming you or disrupting the bunch with a multitude of riders sitting towards the pointy end. With a one to one you’ve only got yourself to blame if you lose. In addition, a solo rider can’t disrupt the bunch! Tommy says battling his own doubts is the biggest challenge in being a consistent crit winner, despite never getting outsprinted at any finish during the 2016 / 2017 season. Lee asks Tommy if he got approached by any NRS sides after his season. Yes he did, but Tommy has no interest in jet setting all over Australia to ride in the national series when “the best riding is on his local doorstep”. Tommy talks about national level racing, where an omnium points system would work better to mitigate the current discrepancy with the team dominance of some. Especially when you consider some races start with a team time trial! Tommy discusses the impact that GC riding has on some races and the implications of the best riders working for each other in the same team, ultimately lowering the racing levels across the board. Whereas in comparison to the local crits, everyone is racing against each other bringing out the best in the field. Lee asks Tommy about the Zwift/indoor training scene but Tommy goes old school with his green Kurt Kinetic trainer. Tommy watches Netflix and has a speed to power converter and off he goes. He also bans himself from watching any Netflix unless he’s on the trainer. Lee asks Tommy if he has a coach. Tommy gets many of his insights these days from Jez Hunt. They talk hours upon hours about training, giving Tommy advice and help. Jez is good at mapping things out and putting cycling into an easy to digest framework. Jez loved trialling things to make him better when he was a pro rider, which is unique approach from a coaching industry that typically goes with the latest norm. Lee asks Tommy about what he should do differently if he had his time again trying to get to the top of the sport. Tommy would have done two more years in Belgium as opposed to heading to the US for financial reasons. Asked about what Tommy does to plan a race his response is “absolutely nothing, if nothing’s happened by 4 laps to go there will definitely be a sprint and during the race it’s all on instincts”. Tommy talks about his best 3 races of the season. His all-time favourite race was when he helped Lee get the win in the Southern Masters A grade race. Tommy’s team ethic shines through discussing his objectives for this coming season. With new teammates on-board and a reflection on his favourable wins last year. Tommy talks about track racers, understanding the dynamics of a crit and the intricacies of a sprint. He mentions a few InForm riders to look our for this coming season. If you’re interested in reading more about Tommy, check out our previously published article here. Some more feedback! I tapped the apple podcast link and sure enough podcasts opened at the cycling corndog show. Well I deleted that from podcasts went back to the fb page and tapped the link again. Podcasts opened with the 10 hour cyclist diary page.